Minimalist farm-to-table recipes created with local fresh produce paired with homemade infused oils, dressings, marinades, pestos and sauces. By eating seasonally, we reap the benefits of good health through nutrition from fresh, unprocessed and sustainable produce. Find more of Kristin’s recipes on her blog, The Intentional Minimalist. Slice the top and bottom off of one medium hakurei turnip. Using a spiral slicer, slice two cups of turnip per salad into long ribbons. 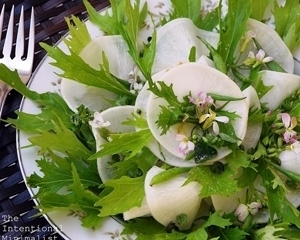 Per salad, remove one quarter cup radish pods and two tablespoons radish pod flowers from stems. Per salad, remove one tablespoon basil blossoms from stems. Plate one cup mizuna greens, top with one cup turnip ribbons, a second cup of mizuna greens, a second cup of turnip ribbons and the baby green beans. Sprinkle on the green bean flowers and the basil blossoms. Before serving, spoon over two teaspoons garlic scape infused olive oil, one teaspoon verjus and sprinkle with salt.